Trump is the latest in a long line of US warrior presidents, a war party president like his predecessors, continuing America’s war on humanity – using an inordinate amount of the nation’s resources on militarism, mass slaughter and destruction. He’s currently at war in multiple theaters, threatening more on North Korea, Iran by illegal sanctions and sabotaging the nuclear agreement, risking confrontation with Russia and China, along with a “military option” against Venezuela at his discretion. Ecuador denounced Trump’s comments, expressing solidarity with the Bolivarian Republic. Colombia, Chile and Peru made similar statements. Washington still thinks of Latin and Central America as its backyard. Colonial thinking never fades. It came in response to its democratically elected Constituent Assembly – established to revise or rewrite the nation’s constitution, aiming to restore order and preserve Bolivarian social democracy. President Maduro blasted US arrogance, its aim to dominate, to control world resources, exploit people everywhere, demand subservience from all nations. 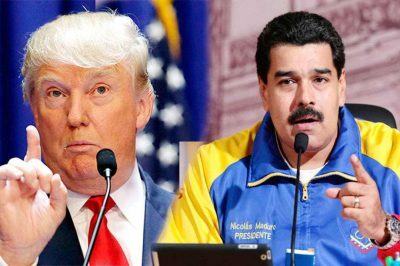 Will Trump order military intervention to oust Venezuela’s government? Given his rage for wars, anything is possible.